Tired of reality shows? want to watch something wholesome for the entire family why not try Dianna Hobbs and family on YouTube. If you don't know who Dianna Hobbs is she is a mother, Wife, Founder of Empowering Everyday Women (EEW), a singer he list goes on she recently started making Vlogs with her family, it shows them going to restaurants, trying new vegan foods . Yava'ah and I realy enjoy them although Yava'ah thinks Dianna is talking to her she tries to talk back lol, The videos are very engaging I highly recommend. I am posting a link to the youtube page HERE. Here is the latest video hope you enjoy!!! You ever notice as soon as your life is looking up you've got direction Everything is going correctly every thing seems to be going wrong. That's because the enemy is trying to take you off course. If your like me you may not deal with drama or unnecessary mess. Although its a good things to avoid stress it can also hurt in the long run . Meaning you may not accomplish what you set out to do. Today is Father's day and I couldn't let today go by without recognizing the father to my daughter and my boyfriend. I am transparent so I know dealing with me is a handful okaaay! I am a Gemini through and through but this man has put up with me and I with him. Often times, I am always in a rush there's always something to be done especially with a child, business and work. Usually the men in our lives suffer. Sometimes we start watching a movie together and sometimes before the middle I am sleep. He never complains just tries to make me watch it again lol. He is always there for Yava'ah teaching her crazy things picking her up when I can't. Relaxing her when I can't get to her. There bond is amazing as well as the bond with his son. With that being said ladies appreciate the men you have in life. Take out time even if it's a second because we will never know how hard it is to be a man. Worth a Try: Alli "The Hair Assistant"
Tired of holding the hair for your stylist while their braiding your hair? Alli The Hair assistant can help with that! Alli "The Hair Assistant" is a tool used to help the professional hair stylist to manage their hair extensions while performing hair extension services. Hey Ya'll!!! I haven't showcased a product in a while so here's one for you. I am currently in a stand still with my hair. I cut it after growing it out for a year only to think I am would like to grow it back out lol (only me). As I am figuring it out, I discovered this product on Facebook. I rushed to Sally's to buy it. I have only had it for a week so I don't know for myself if it works. BUT as I was purchasing the cashier gave me tips how to use it and she stated she used it on her baby hairs and it grew her hair. She stated to" use it as the bottle states". She stated you would see a change within a month. For Wild Growth Oils use the recommended dosage, which is one or both bottles, every other day or 3 times a week. The bottles will last longer and results will come in time (after approx 2 months on average you will know your rate of growth with Wild Growth oils). Some people get more results by using more and some people actually get results by using less than the recommended dosage. Since you are new to the product start with every other day. Feel Free to go to their Facebook page or Website for more information and testimonials. God loves you. I was moved to make this post a few days ago but never did but tonight my heart was really touched to do so. Life gets had sometimes and the people you thought were your ride or dies, day1's, thick and thins end up being gone like the wind. We feel like we have no where to turn. We seem to pray sometimes it seems like no one is there. we often think why are we here? Why do WE have to always go through something. Or you can be that someone who everyone said you were never going to make it. every time you take a step in the right direction its always something to knock you down and you say why bother? Because you are still here! that mean you got work to do. God doesn't waste time on mess you are so special to him that he had to keep you away from people places and things that were going to destroy you. You are too precious to God for that! The stress of life can make you question your existence DON"T . The stuff your going through is making you stronger so you can receive ALL God has for you. here is some encouraging songs to get you through You ARE going to make it! God's got You!!! I don't know who this post would be for. I actually was going to make a post going into a different direction but I have to be obedient. What ever you are going through God has you everything will work out. I know you may feel as though nothing is going your way every where you look you are getting a no or doors are slamming in your face, potential jobs aren't calling you back. But God says he is preserving you for the right time right opportunity, the right partner. Don't give up now this is just the beginning. If you give up now you will never get to your blessing. Trust God it's not over. Doubt the doubt in your mind.God will not leave or forsake you. If you need to feel his presence tell him. Don't sit idly by and let your thoughts take over. Let God take over. Give him your burdens rest easy everything will be alright. To help you through I wanted to post this song by Travis Greene "Made a Way" you may be in the midst of the storm so you can't see the way being made. But I want you to visualize the way being made, the problem being solved. Rejoice because it's all ready done! It's already finished! Like Olivia Pope would say "It's handled" by faith it's over! Your worth isn't reliant on your past. Many of us have had troubled childhoods. Where one or both parents were gone or we felt they didn't love us. With that train of thought we either hunt for love or devour the ones that loves us. MEANING: we search for love or we hurt the people that love us because we feel as though we are not capable of being loved which is wrong. We tie our worth to the one that didn't deserve us,that was no good for us but hurt us. What I have realized is that all of our experiences shape our love and worth for ourselves. What I would like you to do is see yourself differently. You are not the hurt and pain people caused you. I know the those countless heartbreaks and such may have made you think differently about yourself. But I want you to know you not what they said about you. You are worth more than you could ever imagine. Don't allow the past to run your life. Take your life back. Create your future!!! Let's Go!!!! 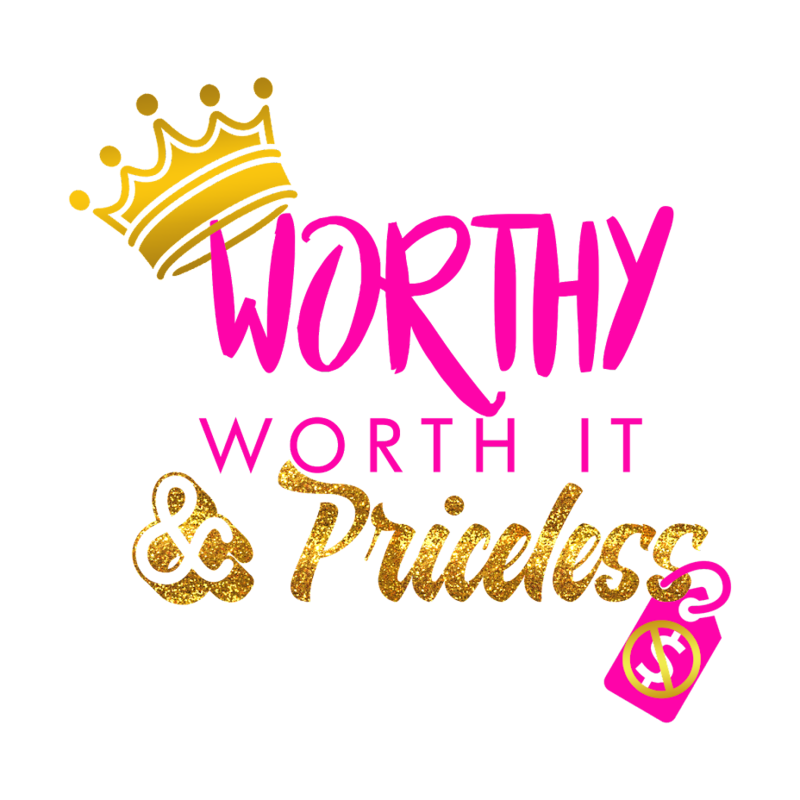 You are WORTHY WORTH IT AND PRICELESS!!!! I was looking at a video link one day it was Oprah's Super Soul Session I believe. It was a few speakers but she had India.Arie on there now i love me some India.Arie I have all of her albums so I was so happy to see her. Can you guess what the title was it was Worthy I almost cried. Now to back track O have been thinking prior to seeing the video that I need to focus more on the blog and W.W.P. movement as a whole. Now let me say this correctly, I am not saying no one else can say Worthy or hating at all. But what it made me see if you won't do it God will get someone else who will. It's not that God is being mean or anything but lives are too precious and need to be saved God loves you but he doesn't have time for timid mess. It's very important for us to do what we are called to do if we don't know what that is seek God for directions. You have to change your mind and what you think you can accomplish or what you think you are capable of. Because if you are on the right path you will do exceedingly,abundantly above and beyond your wildest dreams.